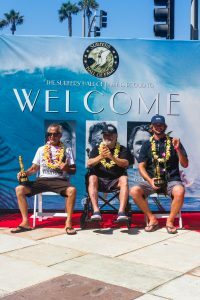 HUNTINGTON BEACH, Calif. – Friday, August 3, 2018 – Under clear skies and against the backdrop of a standing room only crowd, the Surfers’ Hall of Fame today inducted Ben Aipa, Herbie Fletcher and Brett Simpson. All three of the 2018 inductees now have their hand and footprints immortalized in cement for the ages in front of Huntington Surf & Sport at the corner of PCH and Main Street. Further information is available at http://hsssurf.com/shof/. Attendees included surf industry titans Bob Hurley (Hurley), Walter Hoffman (Hoffman Fabrics), Randy Hild (Roxy), Andy Verdone (HB High School surf team coach) and Brett Barnes (Dukes). Huntington Beach brass included mayor Posey and former mayors Jill Hardy and Don MacAllister, City Manager Fred Wilson, Police Chief Robert Handy and Marine Safety Chief Michael Baumgartner among dozens of friends, family and dignitaries. Surf Legends in attendance included former world champions Sunny Garcia, Michael Ho and Peter “PT” Townend along with Chuck Linnen and Jerico Poppler. The first inducteed was Herbie Fletcher. Born in Pasadena in 1948, Herbie Fletcher began surfing at age nine and has strong ties to Huntington Beach having gone to the legendary Huntington Beach High School. Herbie was a semifinalist in the 1966 World Surfing Championships and by the end of the 1970s, he had purchased Astrodeck, founded Herbie Fletcher Surfboards in Dana Point and was among the leaders of the longboard resurgence. In the mid 1980’s Fletcher ventured into surf videos, releasing Wave Warriors, a series of promotional videos for Astrodeck. Herbie was on the vanguard of the tow-in surfing movement, riding 25-foot waves at Waimea Bay on his Kawasaki Jet Ski and in 1987 he towed in Martin Potter, Tom Carroll and Michael Ho into 12-foot waves at Pipeline. “I love surfing so much,” said an elated Herbie Fletcher. “Hobie Alter have me my first job then Bruce Brown put me in one of his surf movies. “With the money that I saved, I gave up my life to go to Hawaii and surf.” Herbie carved a cool little wave into his concrete tribute. Next up was Ben Aipa. Born in Honolulu in 1942, legendary Hawaiian surfer and shaper Ben Aipa was a finalist at the Duke Kahanamoku Invitational Contest at Sunset Beach in 1966 and finished fourth in both the 1967 Makaha International and the 1975 Lightning Bolt Pro. However, it’s as a surfboard shaper that Ben made his most significant imprint on the sport, making the board that fellow Hawaiian Fred Hemmings used to win the World Championship in 1968 and then founded Aipa Surfboards in 1970. Ben invented the doubled-edged swallowtail design in 1972 and followed this with the split-tail design in 1974. Aipa also has served as an informal coach and trainer to such top surfers as Michael Ho and Sunny Garcia. Surfing magazine named Ben one of the Top Ten Shapers of All-Time in 2004. The day’s final inductee was Brett Simpson. Born in 1985 in Long Beach, Brett “Simpo” Simpson grew up in an athletic family headed by his father, Bill Simpson, a tough defensive safety with the Los Angeles Rams in the 1970s. When Brett was 12 years old, he and his friends decided to give surfing a try. Brett’s style caught the eye of Andy Verdone, legendary coach of the Huntington Beach High School surf team. Brett’s career reached stratospheric heights when he defeated reigning World Champion Mick Fanning to win the 2009 US Open of Surfing. The following year, Simpson defeated legendary world champion Kelly Slater to become the first surfer to win back-to-back U.S. Open Championships. PT: “Herbie was responsible for the resurgence of longboarding in the 1980s. Walter Hoffman: “Herbie is a great son-in-law. We still surf together whenever possible. Bob Hurley: “I always try to model my surf stoke after Herbie Fletcher. The Surfers’ Hall of Fame induction ceremony pays tribute to those individuals who have made an indelible mark on the sport, industry and culture of surfing. Annually, tens of thousands of visitors travel to Huntington Beach’s downtown area and literally walk in the footsteps of surfing superstars and legends from several eras including Laird Hamilton, Andy Irons, Jack O’Neill, Robert August, Bob Hurley, Sean Collins, Kelly Slater, Lisa Andersen, Gerry Lopez, George Downing, Shane Dorian, Greg Noll, Corky Carroll, Shaun Tomson, Rob Machado, Timmy Turner, Shawn Stussy, Sumo Sato, Rabbit Kekai and many more, who are already immortalized in cement. The nation’s first imprint collection of legendary surfers, the Surfers’ Hall of Fame celebrated its first induction in 1997 inside of specialty retailer HuntingtonSurf & Sport where several slabs remain. Four years later with the blessing of the City Council and a stunning bronze statue of Duke Kahanamoku serving as a backdrop, the ceremony moved outside to the corner of PCH and Main, less than 100 feet from the famed Huntington Beach Pier, site of the Vans U.S. Open of Surfing. HUNTINGTON BEACH, Calif. – Friday, August 4, 2017 – Hearlded as one of its finest ceremonies to date, the Surfers’ Hall of Fame today welcomed Bethany Hamilton and Mick Fanning as its 2017 inductees. Further information is available at http://hsssurf.com/shof/. Bethany, who survived a tragic shark attack in 2003, went on to become an inspiration to millions of surfers and non-surfers alike across the globe through her story of determination, faith and hope. Mick overcame a career-threatening injury and one of sport’s greatest competitive dynasties, in the form of American Kelly Slater, to reach surfing’s highest echelon three times to date. Both inductees now have their hand and footprints immortalized in cement for the ages in front of Huntington Surf & Sport at the corner of PCH and Main Street. In addition to surf industry titans including Bob Hurley (Hurley), Andy Verdone (HB High School surf team coach), Kelly Gibson (Rip Curl), Brett Barnes (Dukes), John Cobian (Cobian Footwear), Huntington Beach brass included former mayors Jill Hardy and Don MacAllister, City Manager Fred Wilson, Police Chief Robert Handy and Marine Safety Chief Michael Baumgartner among dozens of friends, family and dignitaries. Surf Legends Chuck Linnen, Jerico Poppler and Peter “PT” Townend were among the attendees. Bethany Meilani Hamilton-Dirks was born in Lihue, Kauai. At the age of thirteen, Bethany lost her left arm to a 14-foot tiger shark, which seemed to end her career as a rising surf star. One month after the attack, Bethany returned to the water and within two years had won a national amateur title. In 2007, Bethany realized her dream of surfing professionally and since then her story has been told in a New York Times best selling autobiography and the 2011 film, SOUL SURFER. At the 2016 Fiji Women’s Pro, she placed 3rd after upsetting two of the top seeded women on the world tour, Tyler Wright and Stephanie Gilmore. Bethany is involved in numerous charitable efforts, including her own foundation, Friends of Bethany, which reaches out to amputees and youth, encouraging a broken world by offering hope to overcome through Jesus Christ. Using her platform as a professional athlete to promote living a fit and healthy lifestyle, Bethany authored the book BODY AND SOUL in 2014. Her latest project, UNSTOPPABLE, a surf documentary which will showcase her as one of the best women surfers in the world, will release soon. Bethany’s greatest joy is being a wife and mother, and she continues to touch and inspire lives globally as a professional surfer, and motivational speaker. She will be honored as SIMA’s 2017 Waterman of the Year. Michael Eugene “Mick” Fanning, nicknamed “White Lightning,” was born on June 13, 1981 in Sydney, Australia. In his first year on the pro tour at age 22, Mick finished an incredible 5th in the world, earning the ASP Rookie of the Year award. In 2003 Mick climbed one step higher and finished 4th and many thought 2004 would be Mick’s year. However, a catastrophic freesurfing injury changed everything. Mick ripped his hamstring clean off the bone, was out of action for six months and left questioning whether he’d ever again surf competitively. “I’ve been on tour for 16 years, seen many sights and suffered several embarrassing moments, but I always feel welcome in Surf City, said Fanning. “Being the youngest of five kids I learned to never back down and how to make it back to the top of the peark.” Mick wrote “Enjoy” in concrete. Theory R Properties, is pleased to announce that Morris Construction in conjunction with architect Team Design, are making excellent progress to the 3-phase expansion project at the iconic Pierside Pavilion, which will be rebranded the Huntington Surf and Sport Building and sits across from the Pier on Main Street & Pacific Coast Highway in Huntington Beach. When complete, there will be an additional 30,000 square feet housed in a 4-story building. The expansion will house high-end retail on the ground floor, a 2nd floor upscale restaurant with a rooftop terrace and two floors of office space. Theory R Properties which purchased the building in 2002, commenced a significant remodel and addition to the property in 2016. Phase I which consisted of a refacing and expansion of store fronts to the drip-line was recently completed by renowned architect and owner of Team Design, Jeff Bergsma. Mr. Bergsma designed the entire project consisting of 3 phases. Phase II is the complicated installation of new elevator banks, stairway access to BLK restaurant and a clearing of the courtyard in preparation for phase III which will be the construction of a new tower. Team Design has worked in concert with Morris Construction on Phase II which is nearing completion this summer. The new restaurant space will offer a sprawling 8,000 square feet to a fine dining establishment. It will include a gourmet kitchen, upscale finishes and plenty of attraction allowing a new business to thrive. The seating space includes a large indoor area as well as a partially covered terrace. The most exquisite piece of this space is the large rooftop terrace where diners can enjoy the beautiful views that Huntington Beach has to offer. Over 10,000 square feet of the new expansion are dedicated to office suites, some including balcony space with sweeping views of the Pacific Ocean. “This is an exciting project and opportunity to design and construct a more contemporary look to this landmark building where visitors tend to congregate due to its premier location” stated Mr. Bergsma. 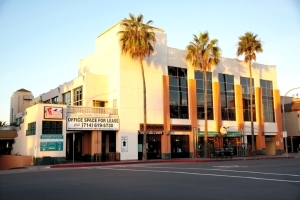 Currently, Huntington Surf and Sport Building is a collection of bustling shops, offices and restaurants in nearly 90,000 square feet of existing space. The new addition will increase the overall square footage to over 120,000 square feet of retail, restaurant and office space. 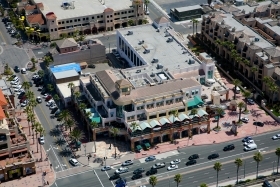 Existing shopping and dining establishments include Huntington Surf & Sport, Volcom, Hurley, Haviannas, Subway, BLK, Ponderosa Steak House, Gallagher’s Pub and Grill, Fred’s Mexican Café and George’s Grill. HUNTINGTON BEACH, CALIF. – Huntington Surf & Sport has completed a major renovation at its downtown (Main and PCH) location and is set to formally unveil its new look on Wednesday, May 25 at 8am. There will be special guest speakers, while Aaron Pai along with two others will cut three ribbons representing the past, present and future of HSS to the surf community, industry, friends and family. Information is available at www.hsssurf.com/. The five time SIMA Retailer of the Year has completed extensive renovations to the store, including “blowing out” all of their front-facing walls on Main and PCH streets some 15 feet and adding more than 3000 square feet of retail space. A massive wetsuit room and flagship stores for Vans, Volcom, Hurley and Channel Islands and allows Huntington Surf & Sport to offer the largest inventory and best selection of hardgoods on the West Coast for surfers to check out the latest products and equipment. Born in Honolulu, Hawaii, Aaron learned to surf at Waikiki and the Huntington Pier, and was taught the true “Aloha Spirit” and importance of family from his Grandma Choi. In 1978 the 23 year-old northside pier rat was hired out in the water on the northside by Huntington Surf & Sport as its first employee, earning $2.25 an hour selling wax, T-shirts and surfboards. The following year, Aaron borrowed some money from his parents then purchased the surf shop. 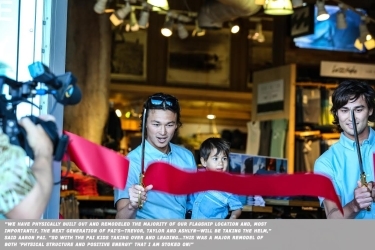 After moving directly across from the pier in 1990, the Pai family began to shape HSS into a one-of-a-kind surf shop that continues to redefine the specialty retail experience. And now the next generation of Pai’s led by Trevor, Taylor and Ashlyn have taken the reins. “I got into this business in 1978 for the love of surfing,” said Aaron. “I wanted to surf for the rest of my life and even today with Trevor, Taylor and Ashlyn, it’s all about our love for the sport of surfing and sharing it with all the guests who come through our doors. For over 30 years HSS has supported the Huntington Beach High School surf team, and local rippers from Timmy Turner to Brett Simpson and Courtney Conlogue. And among the Pai family’s most heartfelt achievements is the Surfers’ Hall of Fame, a surfer’s version of Grauman’s Chinese Theatre. Annually, tens of thousands of visitors walk among the hand and footprints of legendary surfers from Kelly Slater and Laird Hamilton to Sean Collins and Lisa Andersen and experience a little slice of our surfing culture from years past. Aaron and the Pai family love the local surf community. Aaron helped organize and was a featured speaker at the “paddle outs” for the late Andy Irons, a former World Surfing Champion, and for the late Sean Collins, a pioneering surf forecaster and legend among legends in the surf world. HSS has supported the National Scholastic Surfing Association, the Huntington Beach Junior Lifeguards and the Huntington Beach City Surf Contest for over three decades. In August of 2002 Aaron was selected by Surfer Magazine as one of the 25 most powerful people in surfing alongside Laird Hamilton, Kelly Slater, Andy Irons, Sunny Garcia and other icons of the sport of surfing. When Pierside Pavilion was being built across the street from the Huntington Beach Pier in 1989, Aaron Pai knew he would have a battle on his hands — not to keep it out, but to get his business in. To rally community support, Pai stood at the corner of Goldenwest Street and Pacific Coast Highway asking people to sign his petition. Hundreds signed it and Pai brought it to the mayor. Twenty-six years later, Huntington Surf and Sport not only has a lease, but the current building owner, commercial real estate firm Theory R Properties, is renaming Pierside Pavilion after the shop, which sells surf clothing, surfboards and related gear. The renaming is part of a $10-million renovation that has been more than five years in the making for Pierside Pavilion, which houses Diane’s, Fred’s Mexican Cafe and other retail businesses. The renovation, to be completed in summer 2017, will include converting the former theater into office space, expanding out the storefronts and building a 30,000-square-foot tower that will house office and retail space and a restaurant with ocean views. Pai said he is honored to have Pierside Pavilion renamed after his business. In many ways, Huntington Surf and Sport is synonymous with the history of surfing, housing the first inductees of the Surfers’ Hall of Fame in 1997. In 2002, the means of honoring legends of the sport in the form of handprints and footprints extended to the sidewalk outside the shop. Pai, who moved to California from Hawaii at the age of 1, was surfing at Huntington Beach when he was approached about working at a new surf shop called Huntington Beach Surf and Sport, which at the time was on 15th Street at Pacific Coast Highway. A year later, Pai went from being the store’s first employee to becoming store owner when the previous owners wanted out. His father, a structural engineer, and his mother, a teacher, lent him the $60,000 to buy the business. It was a family business from the moment Pai purchased the surf shop in 1979, which back then was a shack that sold a few surfboards, surf waxes and clothing. His parents worked with him behind the scenes to grow the business. That help continued even after Pai vacated the 15th Street location in 1994. His father designed many of the Pierside Pavilion shop’s elements, including a rock archway where an octopus sculpture is still perched and the mezzanine that houses the store’s Java Point cafe. Surf memorabilia and a large photo of his son Taylor catching a massive wave in Newport Beach decorate the shop. On a recent day, a long-haired man was scraping wax off a surfboard not far from a table of neatly folded sweatshirts. “The love of the sport is built into the foundation and into the walls of the store,” Pai said. Now Pai’s children, Trevor, Taylor and Ashlyn, help run the business. Today’s surf consumers are more into customization, Taylor Pai said. “There’s a lot more creativity and innovation between surf brands and surf culture and the young kids, whether it be shaping your own board or coming to the shop to talk to our staff about surfboard design and what goes into a surfboard,” he said. Buying local is another retail trend, said Ashlyn Pai, 24. 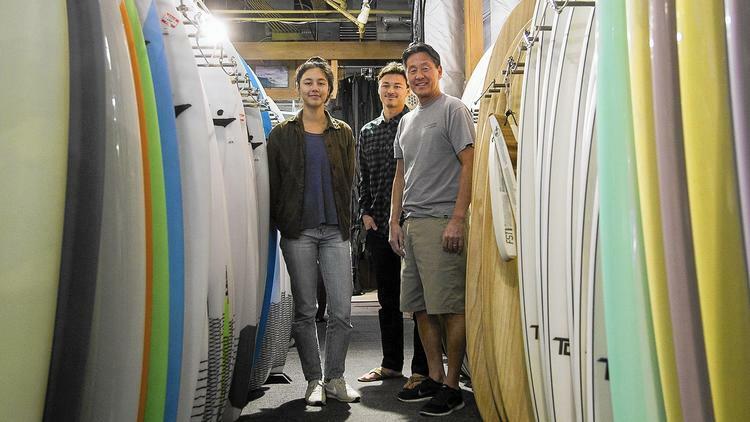 Aaron Pai said he still feels the same excitement when seeing new surfing products come through his store as he did when he started the business nearly 37 years ago. “We’re just lucky and fortunate enough to be able to make a living and live the surfing lifestyle,” he said. The iconic Pierside Pavilion, which sits across from the Pier on Main Street & Pacific Coast Highway in Huntington Beach, will be rebranded the Huntington Surf and Sport Building after its largest tenant: Huntington Surf and Sport. The Huntington Surf and Sport Building is in its final expansion with plans to construct over 27,000 square feet housed in a 4-story building. The new expansion will be attached to the existing Huntington Surf and Sport Building and will house high-end retail on the ground floor, a 2nd floor upscale restaurant with a rooftop terrace and two floors of office space. 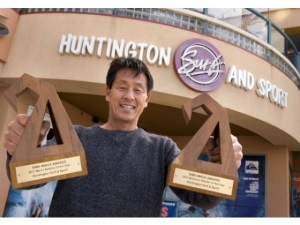 Huntington Surf and Sport was founded in 1978 right on Huntington Beach by Aaron Pai. He was offered an entry level positon for a small surf shop then, only one year after he began, the owners offered Aaron the entire business. He decided to purchase it and thus began Huntington Surf and Sport . 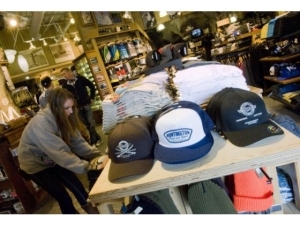 Huntington Surf and Sport is a staple in Huntington Beach and an icon in the surf retail world. Huntington Surf and Sport puts extensive thought into their merchandise and retail displays, always keeping a true “Aloha Spirit”. “It’s all about the love of our Sport of Surfing and sharing it with people,” said Pai, “we’re not about the sale; we’re all about helping people and providing what’s right for them. The sale is just the fruit of helping people.” The name change of Pierside Pavilion comes on Huntington Surf and Sport’s 25th anniversary at the Huntington Beach Pier location. In the new expansion of the Huntington Surf and Sport Building, ground-floor retail shops will allow pedestrians easy access to shopping and offer retailers extra space to display merchandise. This setup will attract more attention to their shops, boosting sales and interest. The additional ground floor retail space at the Huntington Surf and Sport Building will increase the already high foot traffic in the area, bringing more business to the existing shops and restaurants. The new restaurant space will offer a sprawling 8,000 square feet to a fine dining establishment. It will include a gourmet kitchen, upscale finishings and plenty of attraction allowing a new business to thrive. The seating space includes a large indoor area as well as a partially covered terrace. The most exquisite piece of this space is the large rooftop terrace with a reflecting pool where diners can enjoy the beautiful views that Huntington Beach has to offer. Currently, Huntington Surf and Sport Building is a collection of bustling shops, offices and restaurants in nearly 80,000 square feet of existing space. The new addition will increase the overall square footage to over 100,000 square feet of retail, restaurant and office space. 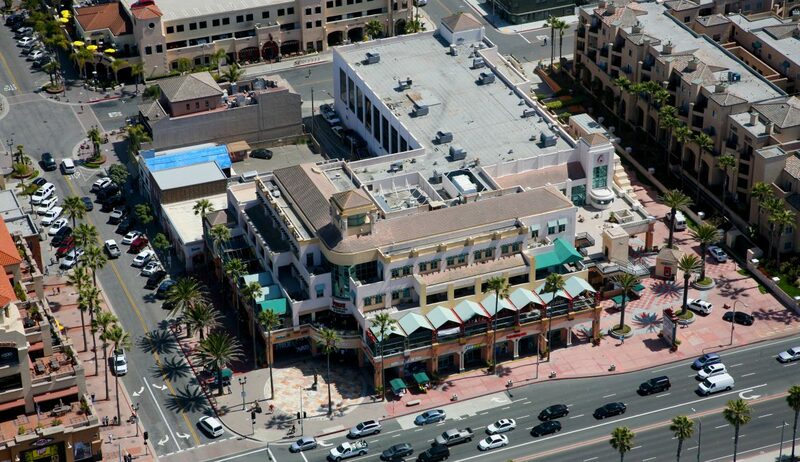 Existing shopping and dining establishments include Huntington Surf & Sport, Subway, Andes Peruvian Arts & Crafts, Gallagher’s Pub and Grill and Surfline, Inc.
Other improvements to the Huntington Beach area are happening around the same time frame. Just to the south of Huntington Surf and Sport Building, a 191,100 square foot center is being constructed. This new establishment, called Pacific City, is planned as a communal city with residents, boutique hotels, restaurants and retail shops. Pacific City is expected to bring in a whole new crowd of people to Huntington Beach, increasing popularity and income for the area. In addition, The Strand on Fifth Street is located just north of the Huntington Surf and Sport Building. The Strand was constructed similarly to the hopes for Pacific City. It held its grand opening six years ago and is currently thriving as an authentic beach lifestyle shopping center with fine dining and community events. Grupo Gallegos resembles more of a sports hub than an advertising agency these days—World Cup games are broadcast on multiple screens throughout its Huntington Beach office, and employees huddle around to follow the action. The “fútbol” immersion is part of the agency’s monthlong social media assignment for two of its major clients, Comcast Corp. and J. C. Penney Co.
Mellow’s digital team is following several games each day that may be of interest to Latino-American audiences, including on weekends. They’re also keeping tabs on popular soccer-related hashtags to see what everyone in social media is talking about. And they’re looking for their own “Oreo moment,” a marketing gem that happened in 2013 during the power outage in the third quarter of the Super Bowl game: the cookie brand’s social media team tweeted a photo of an Oreo with the caption, “Power Out? No problem. You can still dunk in the dark.” The tweet was shared more than 16,000 times. Oreo’s other tweets got about 15 to 30 retweets. When something especially interesting does happen—such as the recent outstanding performance by Mexico’s goalie Memo Ochoa that caused a sensation on Twitter during last week’s match against Brazil—Gallegos’ social media strategist will suggest, “This is how it might fit in our campaign,” Mellow said. The social media assignment is an addition to World Cup-themed advertising campaigns the agency created for both brands. The 40-second TV spot, titled “Pulse,” shows Latinas, “fanaticas,” getting ready for the game day, wearing the colors of their favorite teams and cheering with their families as the female narrator says, “Soccer is for girls and that passion fits us nicely.” The spot will air during all 56 games on Univision. Digital components of the campaign include banner and pre-roll YouTube ads, as well as a Facebook contest in which fans can vote for outfits inspired by the national colors of countries competing in the World Cup. “Mexico won (recently), since the majority of our fan base is from Mexico … they get a lot of support,” Mellow said. “It was really fun. Fans got to engage around the soccer concept but also in” a way where fashion felt really natural. Comcast campaign is about “showing how its Xfinity products help you enjoy the World Cup wherever you want, whether you are on your laptop somewhere, or on your tablet,” he said. Dubbed “Fuel your rivalry,” the campaign theme was inspired by a personal experience Grupo Gallegos’ executive creative director, Juan Oubiña, had. The agency created several 30-second TV ads that were filmed at a food court in a mall and showcase restaurant owners—a Mexican, Italian, American and Brazilian—making fun of each other’s teams. The TV spots will run before and after the games on Univision in markets in which Comcast operates. The social media extension of the TV campaign is “really about, ‘Let’s give people mime images (a photo superimposed with words), video [clips] that they could send to their friends from another country, to smack talk a little bit,’ ” he said. Privately held Grupo Gallegos had an estimated $20 million in revenue in 2013. Its client roster includes the California Milk Processor Board in San Clemente; Wonderful Pistachios; Clorox Co.; Ashland Inc.’s Valvoline; Foster Farms; and G6 Hospitality LLC’s Motel 6 brand. The ultimate surf shop, built and run by surfers for surfers, is taking the surf retail experience to a new level in 2013. Huntington Surf and Sport is in the midst of a major renovation at its downtown Pierside Pavilion location, adding more than 3,000 square feet and a new energy to this iconic store. Upon completion, HSS will offer the largest inventory and best selection of hardgoods in the entire surf industry; a haven for real surfers to get authentic gear. Information is available at www.hsssurf.com. The major changes to HSS come amidst its 35th anniversary celebration and a re-dedication to being the “best surf shop in the world.” The extensive remodel is rolling out in three distinct phases and began with the completion of a “Vans’ Store” within HSS earlier this year. A massive new wetsuit room strategically located for ease of access and featuring hundreds of designs by all the top brands just opened on July 1st. The third and most dramatic change begins in September when HSS “blows out” all of their front-facing walls on Main and PCH streets, and expands the store 15 feet to the existing drip line. Arguably the busiest and most influential surf shop in the world, HSS is already considered by many in the industry to be the epicenter of the surf biz world. No other surf retailer can boast of having Hurley, Volcom and Vans stores within their shop. HSS has won multiple SIMA Image Awards including Retailer of the year in 2004, Women’s retailer of the year in 2009 and both men’s and women’s retailer of the year in 2011, an industry first. And shop owners and brands from around the globe often make pilgrimages to HSS for inspiration. Huntington Surf and Sport was founded in 1978 at PCH and 15th street. Aaron Pai, a 23 year-old northside regular was the first employee hired and earned $2.25 per hour selling wax, T-shirts and surfboards. The next year, “AP” was offered an opportunity to purchase the store, which already had built a strong, local following. He borrowed $60,000 from his parents and purchased the business. Aaron took his love of surfing and began to shape the foundation of what is now considered by many industry insiders to be ground zero of the surf retail world. In the late 1980s HSS fought a fierce battle with other competitors to land a new location at Main Street and PCH. On July 1, 1990 Huntington Surf and Sport opened an ultra-modern, “core” surf shop right across the street from the venerable HB Pier. Huntington Beach lures more than 15 million visitors annually; almost one million to the pier during the U.S. Open of Surfing alone. More than 50,000 cars pass by HSS daily and the foot traffic nearly equals that during the summer months. This amazing location brought instant awareness, but Aaron Pai felt a responsibility to represent the sport in a way that non-core retailers can’t. A tremendous amount of thought and creativity go into displays and merchandising, ensuring that they are both visually appealing and functional for surf enthusiasts. Before warranties even existed, HSS would offer repairs or replacements on faulty products. Java Point provides the best coffee in Huntington Beach and fuels many a dawn patroller. For years the store has supported the Huntington Beach High School surf team and local rippers from Jeff Deffenbaugh to Brett Simpson and Courtney Conlogue. 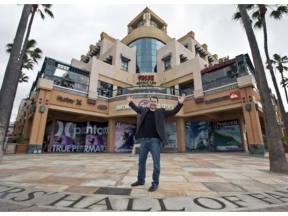 And among AP’s most heartfelt achievements is the Surfers’ Hall of Fame, a surfer’s version of Mann’s Chinese Theater. Annually, tens of thousands of visitors walk among the hand and footprints of legendary surfers from Kelly Slater and Laird Hamilton to Jack O’Neill, Sean Collins and Lisa Andersen. The love for surfing and wanting to give back has made Pai and his staff successful. But Aaron Pai and his family remain surfers, first and foremost. Many of the store’s customers are family and friends–folks the Pai’s have known for decades. “When I walk into the store, the smell of wax and wetsuits still intrigues me,” said AP. “It’s like a candy store seeing the rows of surfboards and leashes.” The remodel will, no doubt, only add to that stoke and energy for another 35 years! 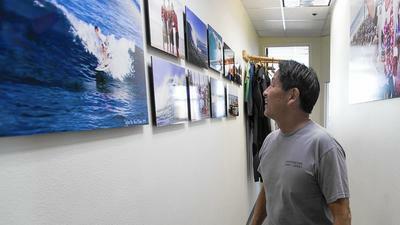 Aaron Pai has one goal for his business, Huntington Surf and Sport: To be the best surf shop in the world. Kahanamoku, the father of surfing, welcomes passersby as they stroll or drive past Main Street and Pacific Coast Highway. “It’s all about the sport of surfing, the love of the sport of surfing, and sharing it with all the customers and guests who walk through our doors,” Pai said in a past OC Register story. The main shop started 34 years ago, and two more locations were added through the years – one smaller shop at Warner and Pacific Coast Highway, and a big store at Bella Terra near the 405 Freeway and Beach Boulevard. Every single family member has worked at the business, and it’s not uncommon to see young up-and-coming surfers pulling double duty and working at one of the retail stores. You couldn’t ask for better advertising – more than 50,000 cars pass by the shop each year along Coast Highway, with about 15 million people going to the beach each year, according to the Huntington Beach Chamber of Commerce. Big surf photos touting the latest product or hottest surfer grace the glass windows. One unique aspect of the shop is the Surfers’ Hall of Fame hand and foot prints set in stone in front of the flagship shop – where icons and legends such as Kelly Slater and the late Andy Irons have been honored, along with many local heroes who have had an impact on the sport and culture. Earlier this year, Pai was honored by winning two big awards at the Surf Industry Manufacturing Association Image Awards. He celebrated the Men’s and Women’s Retailer of the Year award by doing two big jumps on stage in front of key industry leaders. HUNTINGTON BEACH, CA. 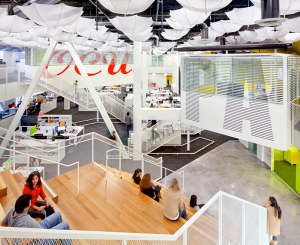 (Dec 1, 2012) – Huntington Beach-based advertising firm Grupo Gallegos, widely known for its award-winning Spanish-language campaigns, has been named to Inc.’s list of the 20 World’s Coolest Offices. The honor puts the decade-old company among some of the planet’s most recognizable brands, including heavy hitters Twitter, Urban Outfitters, Microsoft and Google. Mayhem is Everywhere and Dos Equis’ The Most Interesting Man in the World are but a few examples – can’t come to fruition without a fun, vibrant environment that fosters brilliant creativity. Conversely, such ideas rarely come about in a dull, conventional environment. Looking at the workspaces used by Inc.’s other top 20 choices, there’s an obvious thread that connects each company, no matter how different their business model or industry sector: wide open, collaborative spaces. Essentially, Grupo Gallegos, which supplanted popular high school stomping ground Pierside Surf City 6 Cinemas on Pacific Coast Highway, is more like an oversized adult playground, a fantasy factory – the kind of dreamy, surreal work environment you have to see to believe. 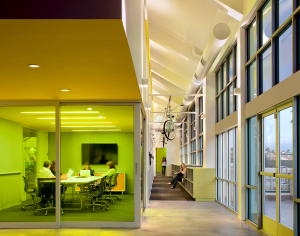 The open layout ditches traditional workspaces to better promote easy collaboration, and the decor perfectly represents Southern California culture through bright colors and glitzy decorations. For example, custom white umbrellas adorn Grupo’s ceiling, a small nod to Hollywood extravagance. In describing the company’s workplace paradise, company founder John Gallegos says that it’s all in an effort to promote creativity and collaboration among employees, which is an integral aspect of Grupo’s DNA. In addition, the office’s basketball court, ping-pong table, lounges, kitchen and video game areas are extra perks. HUNTINGTON BEACH, CA. 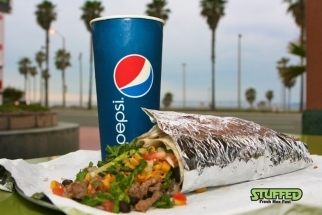 (May 4, 2012) – Surf City USA® welcomes a new B.Y.O.B – Build Your Own Burrito, Fresh – Mex – Fast casual dining restaurant to downtown Huntington Beach. 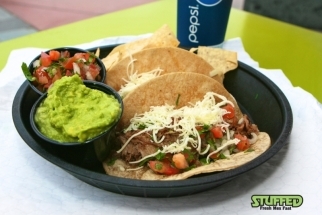 STUFFED, Fresh Mex Fast, has launched its first West Coast location, with many more to come. Friday, May 4th will be the official grand opening celebration and STUFFED is offering FREEburritos to the public between the hours of 12pm and 2pm and also 50% off the regular menu all day! 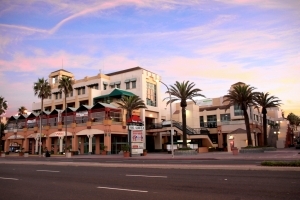 STUFFED is located in sunny downtown Huntington Beach, on the corner of PCH and Main Street, (300 PCH), overlooking the Pacific Ocean and the pier. STUFFED will kick off its grand opening with a ribbon cutting ceremony at 11:30am with the HB Chamber of Commerce, followed by the 1st Annual STUFFED burrito-eating contest FUNdraiser at noon. This year’s contenders have been chosen from longtime sports rivals, Edison High and Huntington Beach High, battling in an all-out effort to be the winning school and take home the grand prize of $500, and a STUFFED winner’s plaque to proudly display! The intriguing and unusual part of this contest is the two competitors are both WOMEN! Representing Huntington Beach High School is Assistant Principal of Activities, Mrs. Shelley Morris, and representing Edison High School is the School Principal, Dr. D’Liese Melendrez. So come cheer on your favorite school! STUFFED has also donated a week’s vacation at a luxurious Palm Desert timeshare, and the proceeds from raffle tickets that will be sold all week leading up to the grand opening will be split between the two schools, so they will both be winners!! A STUFFED burrito starts with a fresh prepared pressed tortilla, wrapped as a burrito or taco. Or try STUFFED’s Bikini Bowl (a burrito without the tortilla) or salads, STUFFED with authentic Mexican flavors and topped off with an array of signature STUFFED savory sauces! Guests can choose from naturally raised, hormone-free chicken, Angus steak, pork and tilapia, or the STUFFED vegetarian option, the famous STUFFED black beans or pinto beans served with homemade guacamole made from ripe avocados. Guests can then customize their B.Y.O.B. meals by adding even more flavor by topping them off with freshly prepared homemade spicy salsa from the STUFFED salsa bar. The store, the first in the U.S. for the Brazilian maker of flip-flops and sandals, has a customization station and special World Cup-themed sandals. Havaianas, the Brazilian maker of fashionable flip-flops, opens its first U.S. store Sunday, June 27, in Huntington Beach. Located on Pacific Coast Highway across from the Huntington Beach Pier, the 1,250-square-foot Havaianas store includes a permanent customization station, where you can design your own pair of flip-flops by choosing a strap and contrasting foot bed with the option of adding a Swarovski crystal charm before a machine clamps everything into place. The Havaianas boutique, designed by Criacitta, also based in Sao Paulo, features fun furniture that matches the theme — a chandelier made from mini sandals and flip-flop-inspired stools. Walls are covered with a colorful array of 150 Havaianas styles, ranging in price from $18 to $26 for women, men, children and babies. says Glen Lagerstrom, executive vice president of Alpargatas USA, which handles sales and distribution for the brand nationwide. Lagerstrom says the brand plans to open retail stores throughout 2011 in key cities such as Los Angeles, Miami and New York. Havaianas, which means Hawaiians in Portuguese, was founded in 1962 in Sao Paulo and based its shoe on the “zori,” a Japanese sandal with a rice straw sole. Havaianas foot beds still have a faux textured rice pattern, but in the last decade, the shoe has departed from its humble origins as an everyday sandal in Brazil to become an accessible international luxury item. This led to a partnership with jeweler H Stern to make a flip-flop encrusted with 18-karat gold and diamonds in 2004. The Orange County Havaianas store will carry brand exclusives such as the new Art Nouveau and Art Deco design collections, plus this year’s special collaborations with Conservation International, an environmental nonprofit based in Arlington, Va., and Threadless, an Internet-based do-it-yourself design community. For Conservation International, Havaianas created three marine-life-inspired foot beds that retail for $24, with 7% of sale proceeds pledged to marine conservation efforts in Brazil. The Threadless collaboration, in-store by July 12, features $25 flip-flops featuring two designs “crowd-sourced” through an online design challenge, plus four popular graphics from the Chicago company’s design community. The store carries sandals Havaianas created for the 2010 FIFA World Cup in the colors of the qualifying national teams, including the U.S. and Brazil. In 1998, Havaianas first created a sandal for the Brazilian national team with a small flag on the strap, though Brazil, a five-title winner, didn’t capture the World Cup that year. 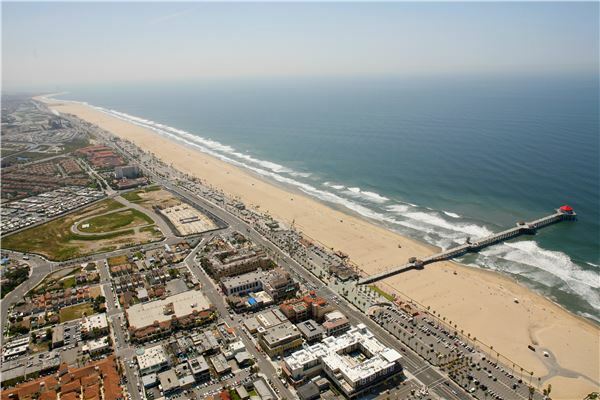 HUNTINGTON BEACH – When is a 180-degree ocean view from Pacific Coast Highway not a major plus for business in Huntington Beach? When you’re trying to help a movie theater stay in business, like Joe Daichendt and his father have for the past seven years. The Daichendts own Pierside Pavilion, the retail plaza steps from the sand and downtown. Joe Daichendt is moving forward with a plan to transform the building – once the home of a six-screen movie theater – into a center for retail, restaurants and offices. A movie theater on the sand is an echo of the past, said his father, Gary Daichendt. The council has approved a partnership between the city’s redevelopment agency and Pierside Pavilion to redevelop the property. This will be accomplished in a two-phase plan that will eliminate the movie theater and redesign the building’s interior to accommodate and attract new businesses. Discussions to close the movie theater began in 2005. Two other companies have operated the theater since Pierside Pavilion LLC bought the property in 2002. After the third company vacated in 2003, Gary Daichendt said they could not attract another company and movie operations were shut down in 2006. The market was changing and the theater was struggling – the equipment was not state-of-the-art, its six screens could not compete with other larger local cinemas, and beach traffic was an inconvenience. But Joe Daichendt hopes that the ocean will work to his advantage for new plans for Pierside Pavilion. Current plans for the property envision a ground floor of retailers, an upscale restaurant on the second floor that will take full advantage of the view, and two floors of office space on top. This will come in the second phase of the project, which is contingent on the adoption of the city’s downtown specific plan by the council and the state Coastal Commission. Council members expressed concern that the plans continue to allocate space for a nightclub and restaurants that serve alcohol, but Gary Daichendt assured them that he would not allow bars on the property. Councilman Devin Dwyer said the city should approve the agreement since past efforts to attract a movie company were unsuccessful. The council voted unanimously at the July 6 meeting to impose a $50,000 fine for each year Pierside Pavilion LLC delays the plans in the approved agreement. The first phase of the plan is beginning immediately and timely revitalization of Pierside Pavilion is in the best interests of the city as well as their own, Joe Daichendt said. “(This agreement) will make Pierside Pavilion the appropriate front door to downtown that it was always intended to be,” Joe Daichendt said. It may be called Surf City, but for many residents, Huntington Beach is the home of the Golden Bear. Since the Bear’s demise in the late 1980s, some residents have been waiting, or actively plotting, its return — and now Ladera Ranch resident Joe Daichendt, the co-owner of Pierside Pavilion with his father Gary, is trying to bring a Golden Bear concert venue to the city in summer 2011. The Golden Bear was a music venue where the likes of John Denver, Jimi Hendrix, Bob Dylan and Steve Martin all played to an intimate crowd. The Bear started out as a restaurant in 1929, but grew into a rock-and-roll legend in 1963. The who’s-who of music played in the ocean-side venue until it was demolished in 1986. Although Daichendt wants to build his venue in almost the exact spot it used to be, he isn’t bringing the Golden Bear back, he said. At least not yet. Daichendt is in negotiations with the family of the original owners for the rights to the name, but until then, it’s just another venue, he said. The $2-million, about 7,000-square-foot facility would house as many as 400 spectators in a Chicago-basement-style theater, similar to San Diego’s Gaslamp Quarter. Patrons would dine on authentic Chicago-style food, and the facility is requesting a full liquor license. Residents would enter the Bear by ascending the bright red steps leading to Fred’s Mexican Cafe, and directly inside, Daichendt wants to display surf and oil memorabilia to commemorate the city’s unique history. The venue would cater to local up-and-coming bands and comedy shows. It could also host big-name acts, but it wouldn’t be trying to compete with the bigger venues. “This is not trying to compete with the Grove. The idea is to bring relevant, local talent through the space,” he said. To bring the Bear back to life, Daichendt has to obtain various permits, including one for alcohol, which has to be approved by the Police Department. Daichendt said he recognizes downtown residents will have concerns about the alcohol license and parking issues, but said he plans to work with the residents and be a good neighbor. Kim Kramer,spokesman for the Huntington Beach Downtown Residents Assn., announced Daichendt is trying to bring back the Bear at a Town Hall meeting March 4.